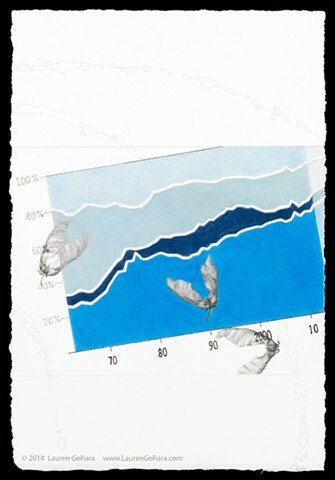 The drawing is dominated by a single graph of changes in federal budget spending since 1963. There are four broad categories, from bottom to top: mandatory expenditures (Medicare, Social Security, Medicaid, et al. ); interest; defense; and non-defense discretionary expenses. Mandatory expenditures have risen to 60% of the budget as of 2014. Sycamore maple seeds waft through, a symbol of the cycle of life -- the same inexorable cycle helping to drive the rise in healthcare costs and retirement expenses. Particle physics tracks swell in the background.